The image below is our "total" decipherment of Avebury Stone #30 which places the previously deciphered faces and sides of Avebury Stone #30 in the heavens at their decipherment-mandated corresponding stars. 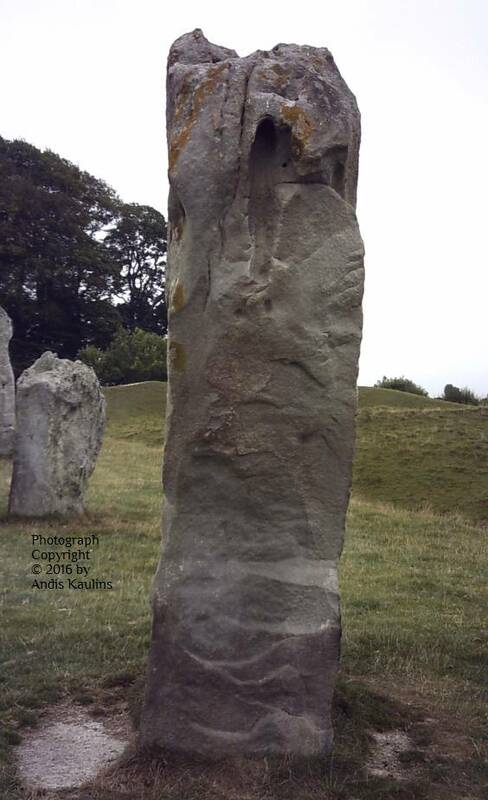 The combined result is a ritual scene (perhaps a funerary scene) with woman, child, man, and a figure we call "the Druid" (i.e. a wise man of old, a shaman, a Neolithic physician), together with the presumably memorial stone. Although we generally have used a date of 2500 B.C. as the date of origin of the carved stones of Avebury Henge, in our software astronomy program Starry Night Pro 3.1, which is is our main tool for astronomical decipherment work, we here also tried a date of ca. 3100 B.C. because of the round "foot" of the lying figure which would then possibly be pointing to the Autumn Equinox in that era. The actual date of origin could be, but does not have to be that date. 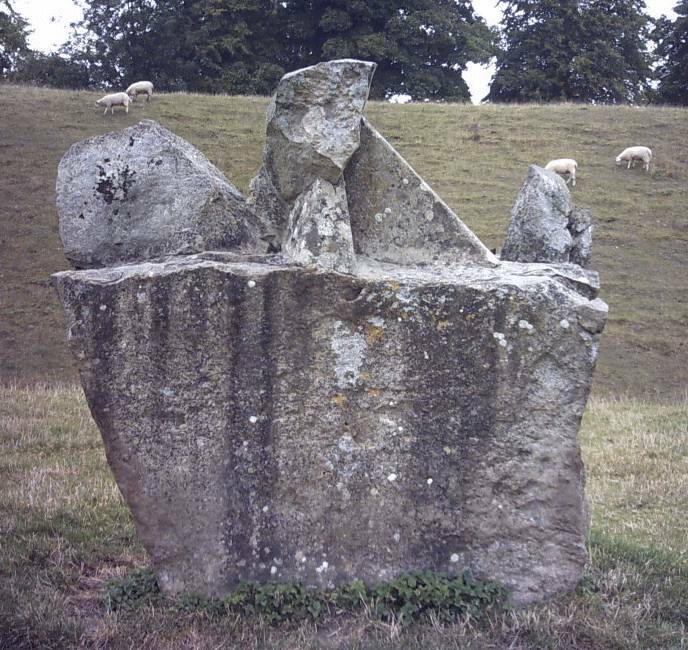 To our initial surprise, there is some overlap of the carved sides and not all elements of the henge outward face appear to be essential for the scene, except e.g. 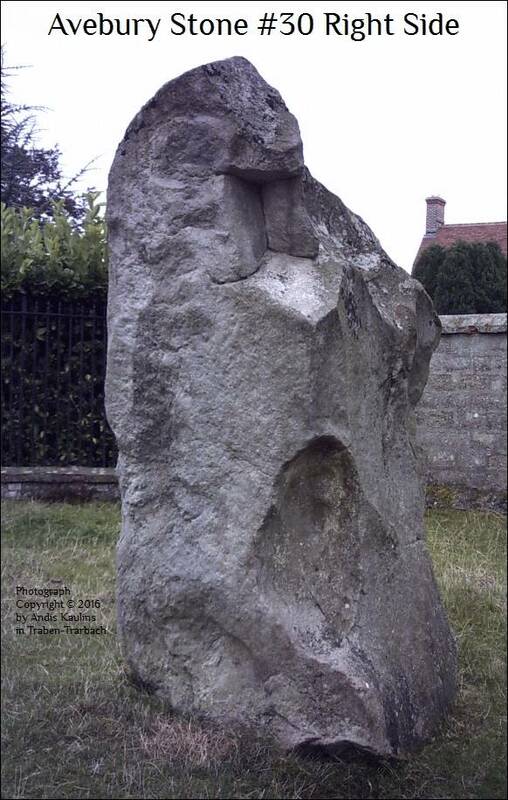 to add a shoulder to the man lying at the bottom, but the general nature of the scene formed by combining the 2 faces and 2 narrower sides of Avebury Stone #30 is clear. 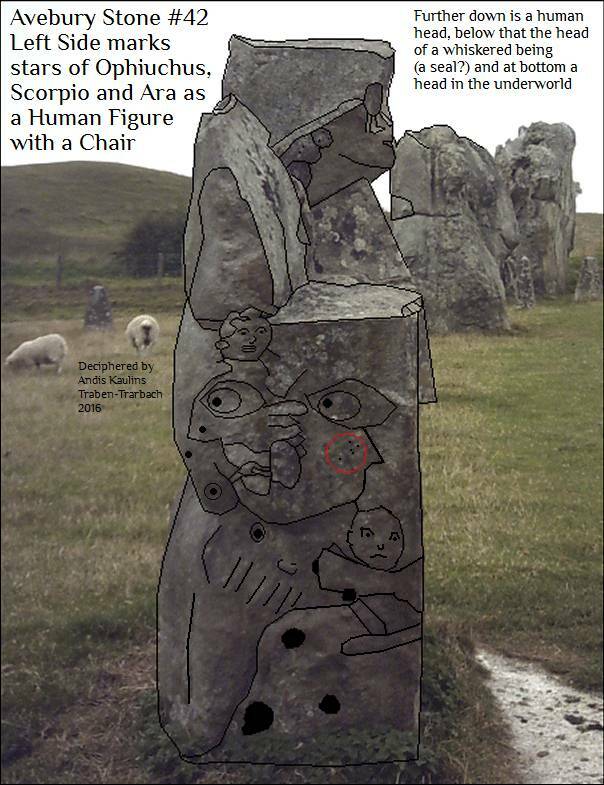 UPDATE: We now see that in fact some of the lines of the henge outward face added to the overlapping parts of the stones could create a larger "sitting" man being attended to on his leg by the Druid, that sitting man with his head looking right just under the heads of the woman and child. 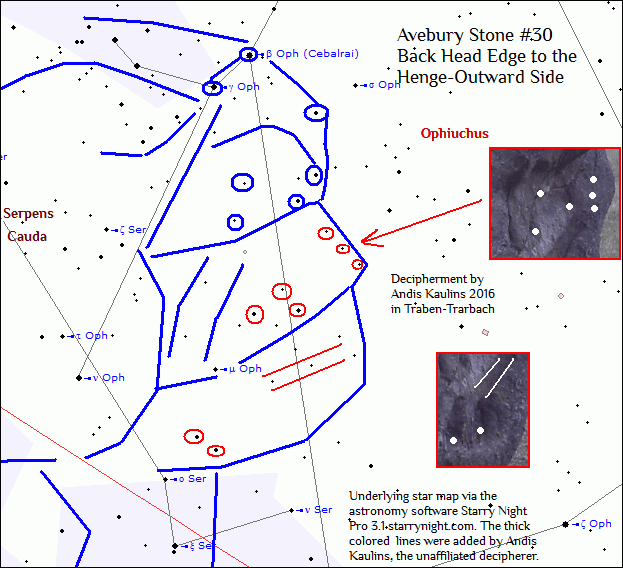 The henge-inward face of Avebury Stone #30 shows stars in Aquila, Sagitta, Vulpecula, and Cygnus which are located directly above and neighboring the stars represented by the henge-outward face of Avebury Stone #30. 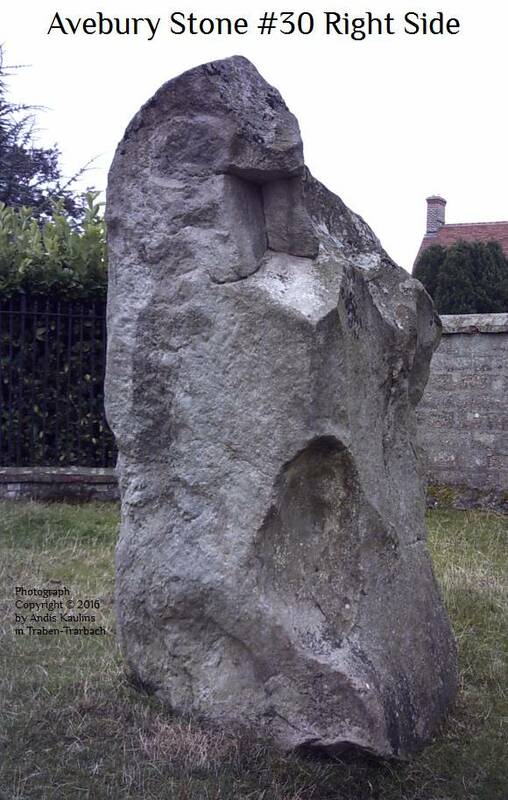 Note the "gate" in the background which is the entry point at Avebury Henge when coming from the Alexander Keiller Museum and appurtenant buildings. 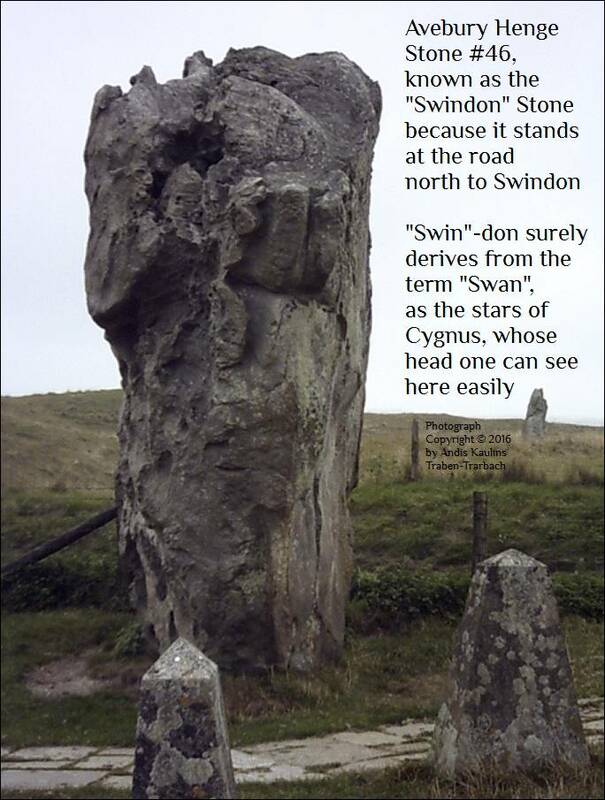 This is then the first stone that a visitor sees close-up at that entry. 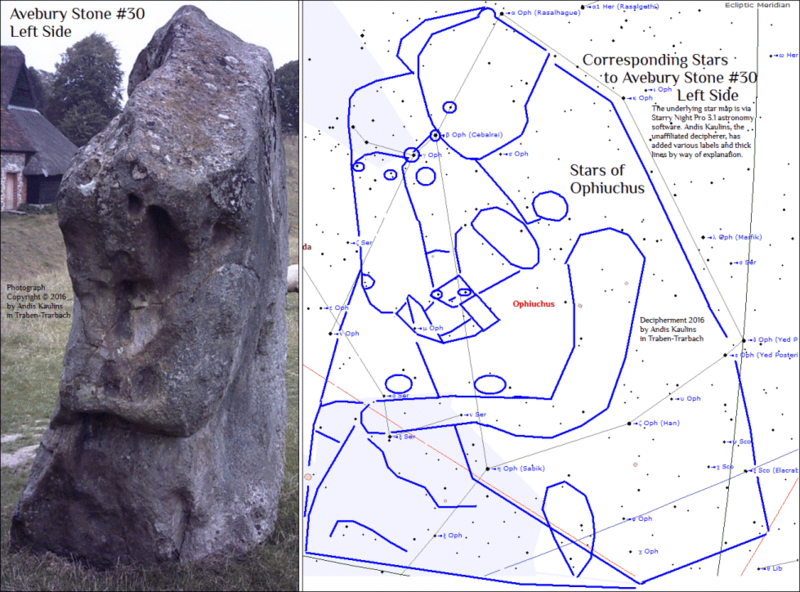 Avebury Stone #30 Henge Inward Face Corresponding Stars in Aquila, Sagitta, Vulpecula, and Cygnus which are located directly above and neighboring the stars represented by the henge-outward face of Avebury Stone #30. 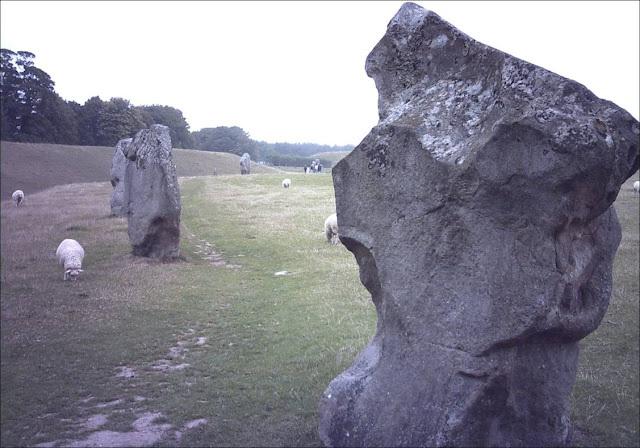 There are several human faces figures carved on the stone, one looking left, while the entire henge-inward face of the stone represents a human face with the mouth at the large triangle to the right and the ear as the head of the smaller human face to the left. 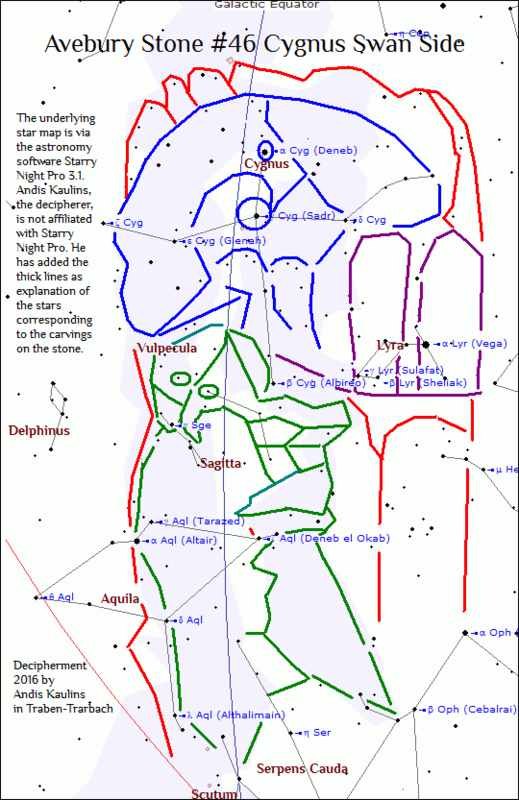 Bird figures represent Aquila and Cygnus. 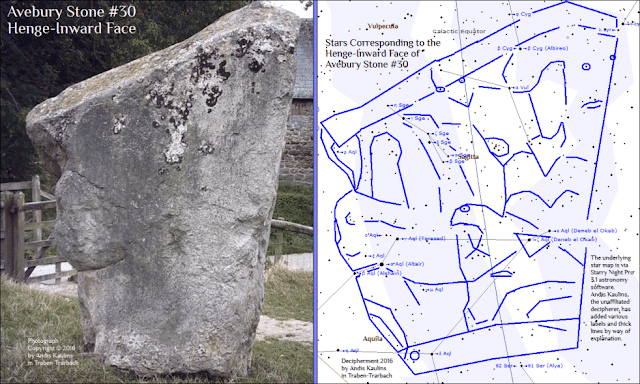 The Right Side of Avebury Stone #30 marks stars in Aquila, Scutum and the top of Sagittarius to the right of the stars represented by the henge outward face of Avebury Stone #30. 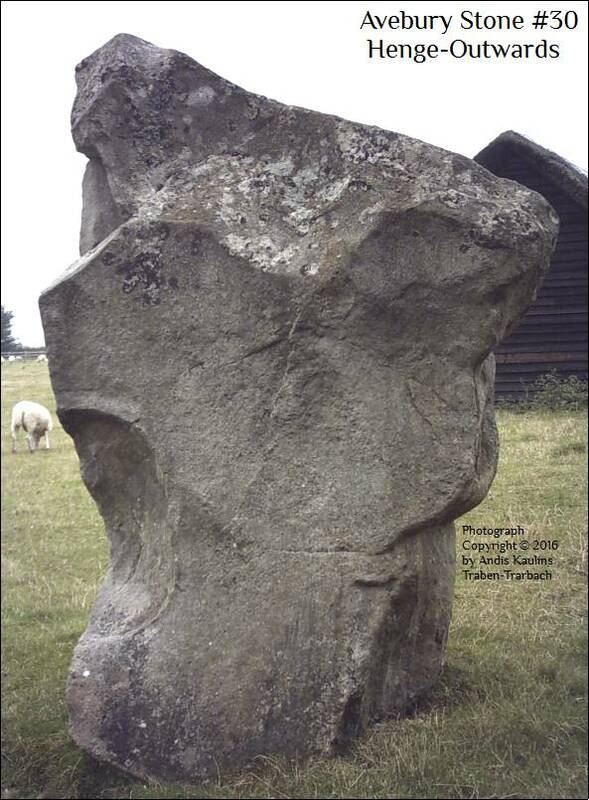 The right side of Avebury Stone #30 marks stars in Aquila, Scutum and Sagittarius to the right of the stars marked on the henge-outward face of Avebury Stone #30. 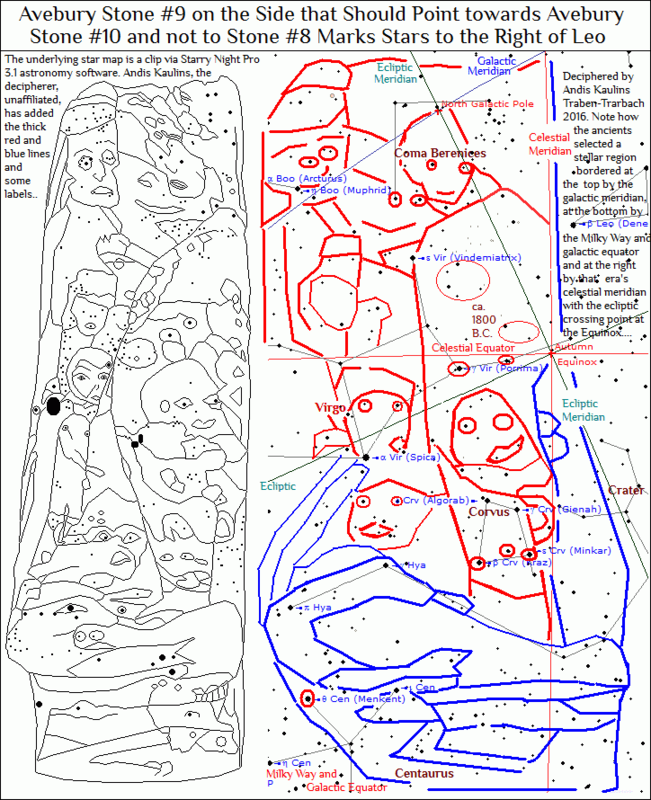 Figures represented are a woman with child (possible an elder below that), at least one large bird for Aquila in the middle, and several other possible human faces, including the entire stone side shape as a human face (looking right). 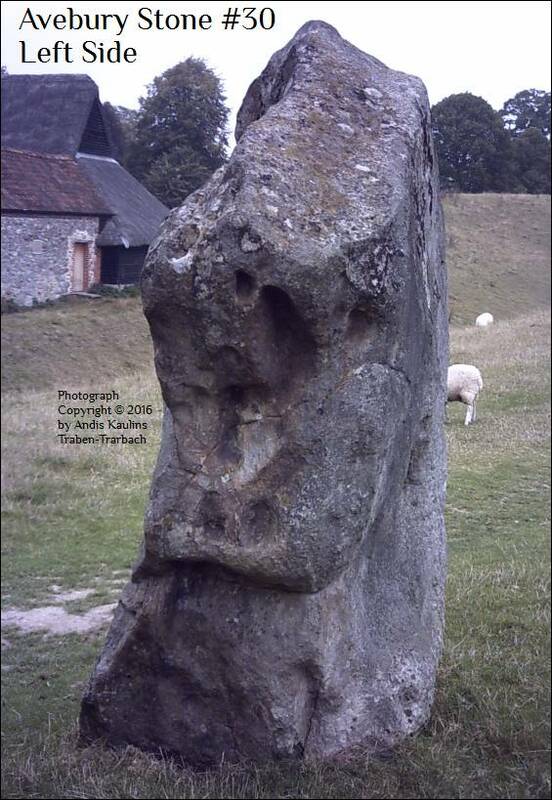 The next posting shows a photograph and decipherment of the henge-inward face of Avebury Stone #30. The Left Side of Avebury Stone #30 viewed henge-outward marks stars of Ophiuchus principally as two human figures, one with his or her arm around the other figure. There is the head of another figure at the bottom. 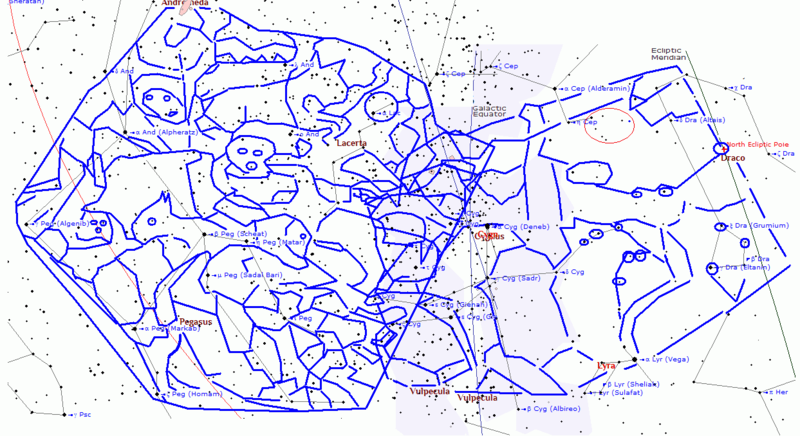 The stars represented here directly neighbor the stars represented by the henge-outward face of the stone. Below, we first show our photograph of the left side Avebury Stone #30. 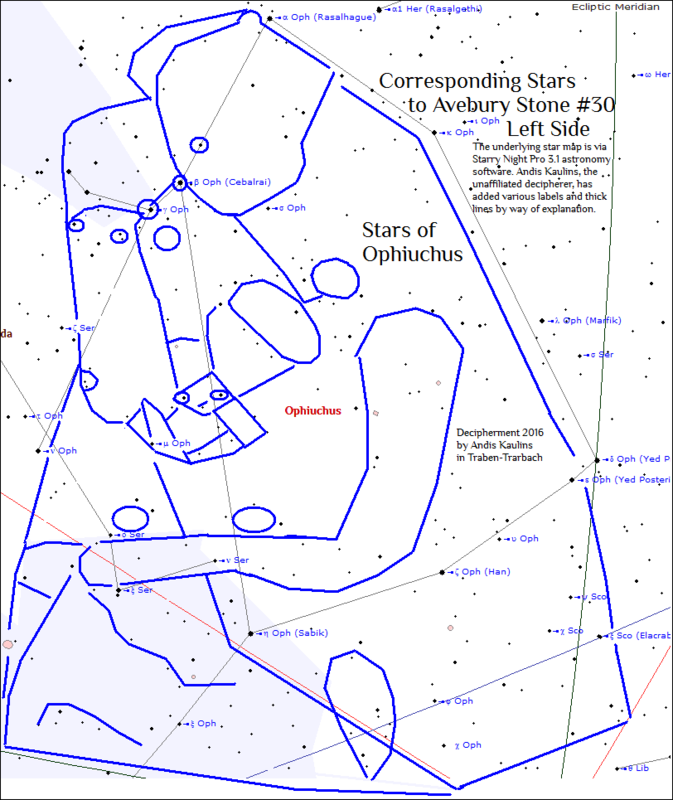 That image is followed by a graphic of our decipherment of the corresponding stars in Ophiuchus, using an underlying star map via the astronomy software Starry Night Pro 3.1, http://www.starrynight.com. The subsequent posting shows a photo of the Right Side of Avebury Stone #30 plus its astronomical decipherment. The henge-outward face of Avebury Stone #30 stands somewhat at an angle so we also took a photograph that includes the henge-outward face plus the edge of the back of the head. 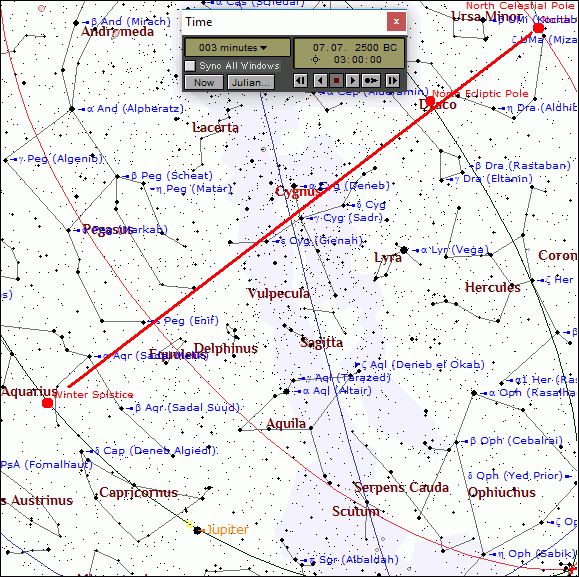 That photograph is shown below and followed by a clip in which we mark the back head edge area in red. 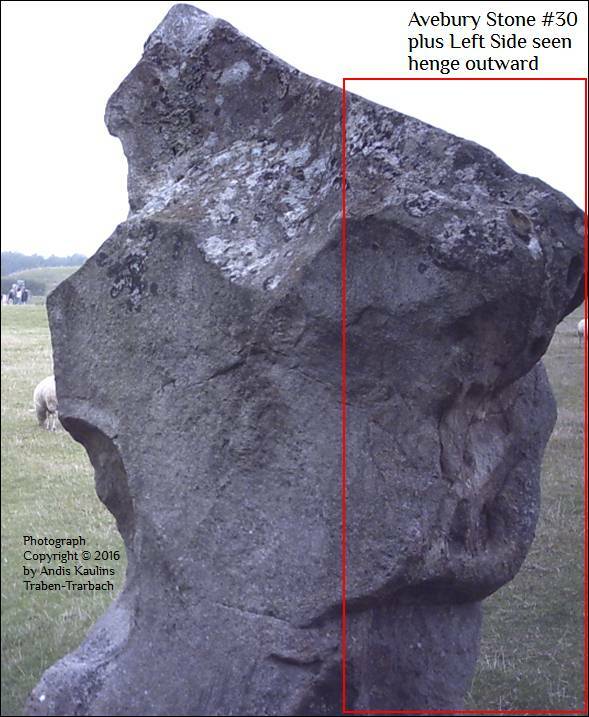 Below is the edge of the back of the head as marked and as viewed from the perspective angle of the henge-outward face. 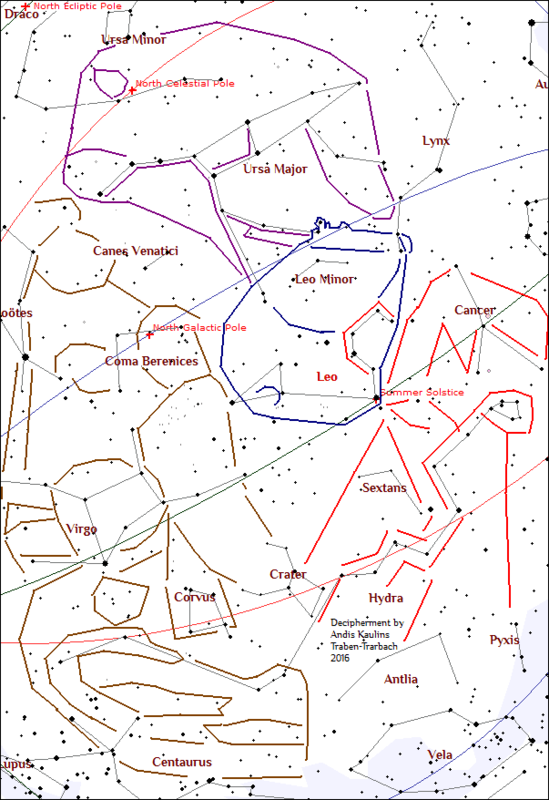 The full "back of the head" is then shown in different photographs as a large figure in its own right and a more complete decipherment of the corresponding stars is then found in the subsequent posting. 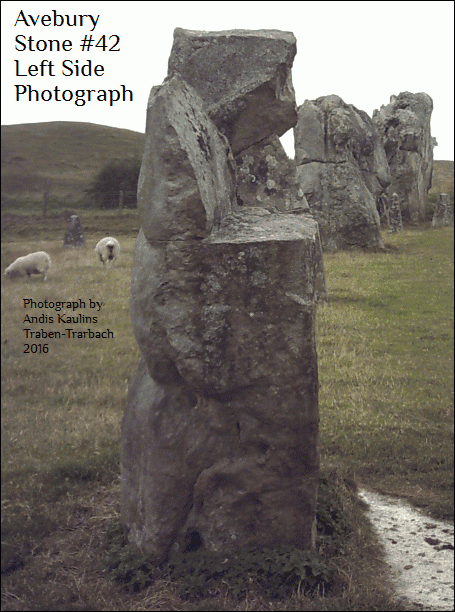 The Alexander Keiller Museum and adjacent buildings at Avebury were our first stop in visiting Avebury Henge. We had a cup of hot coffee there to offset the cold and overcast weather that prevailed on our visiting day. 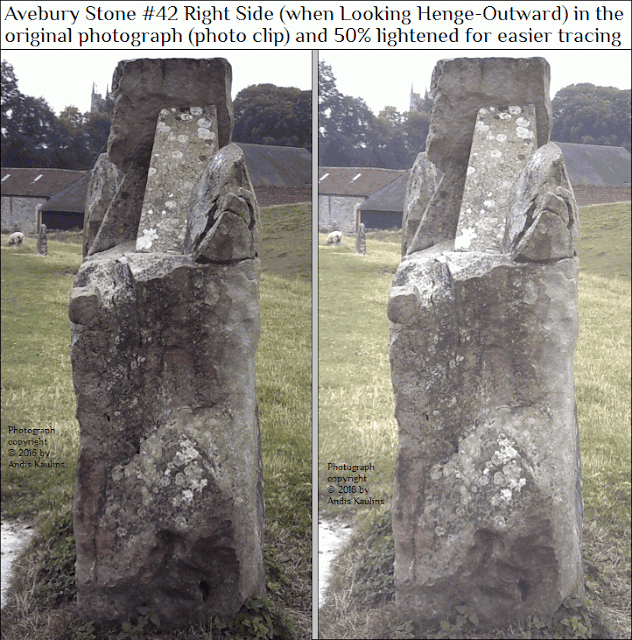 That same weather, however, provided advantageous non-glare non-shadow conditions to permit the taking of no-nonsense photographs of the Avebury Henge stones. When one subsequently enters the Avebury Henge Circle from the Alexander Keiller buildings location, the first stone in the Northwest Sector of stones is Avebury Stone #30. 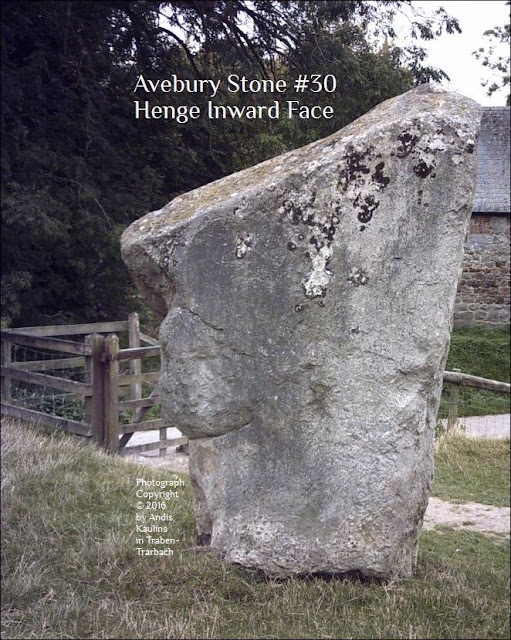 Below we present our photographs and decipherment of the henge-outward face of Avebury Stone #30 and follow with postings that decipher the henge-inward face and the two narrower adjoining sides of the stone. This decipherment was more difficult than it appears because the similar open "shape" formed at this stellar region by the strands of the Milky Way (the purple-bluish colored area in the sky map) surely served the ancients as the idea for this figure in stone, but the stone was then actually carved based on a similar shape "drawn" in the surrounding stars. We discovered this by placing the above star map transparently on our above photo of Stone #30. 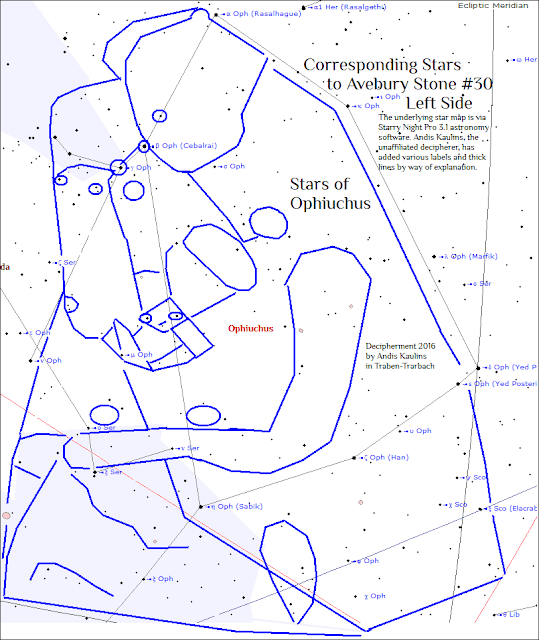 The ancients clearly used a much larger area of stars to "draw" a similar figure. 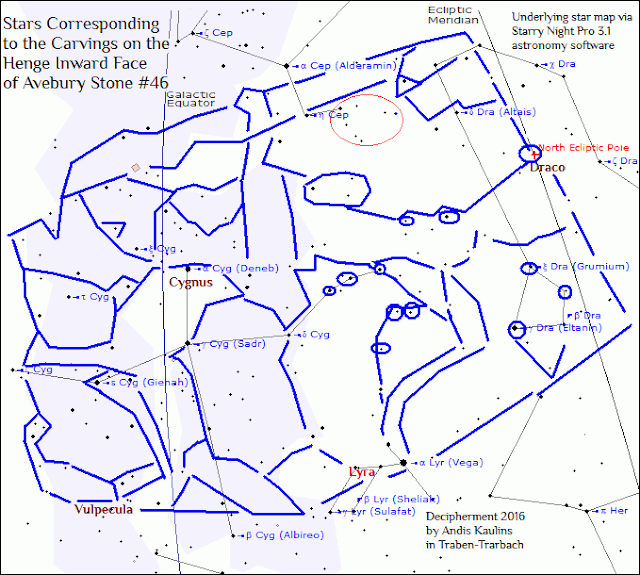 Avebury Stone #30 Corresponding Stars and Shape using the Sky Map shows that Stone #30 marks stars from the bottom of Aquila to Serpens Cauda and Scutum and then the edge of Ophiuchus and the top of Sagittarius. 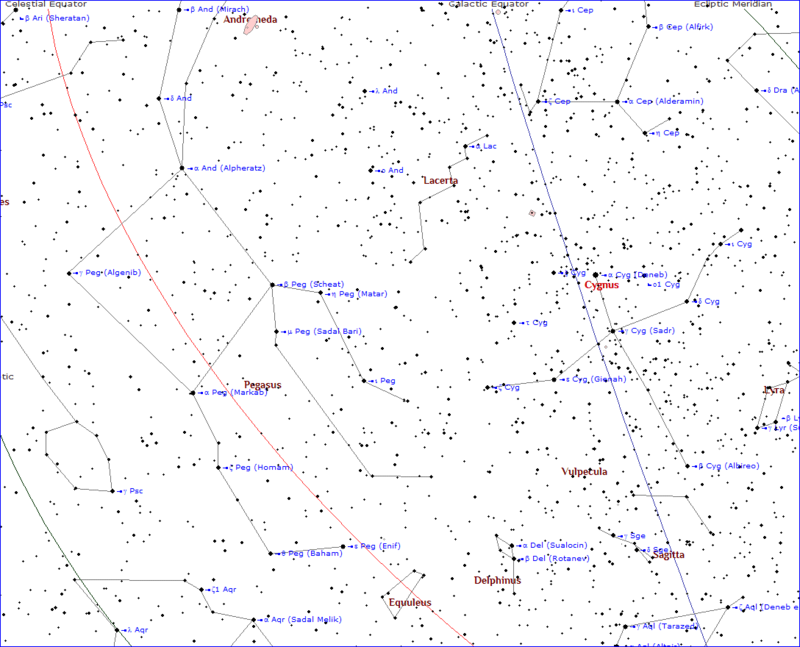 The ancients, veritably, "mapped" the sky of stars in stone. 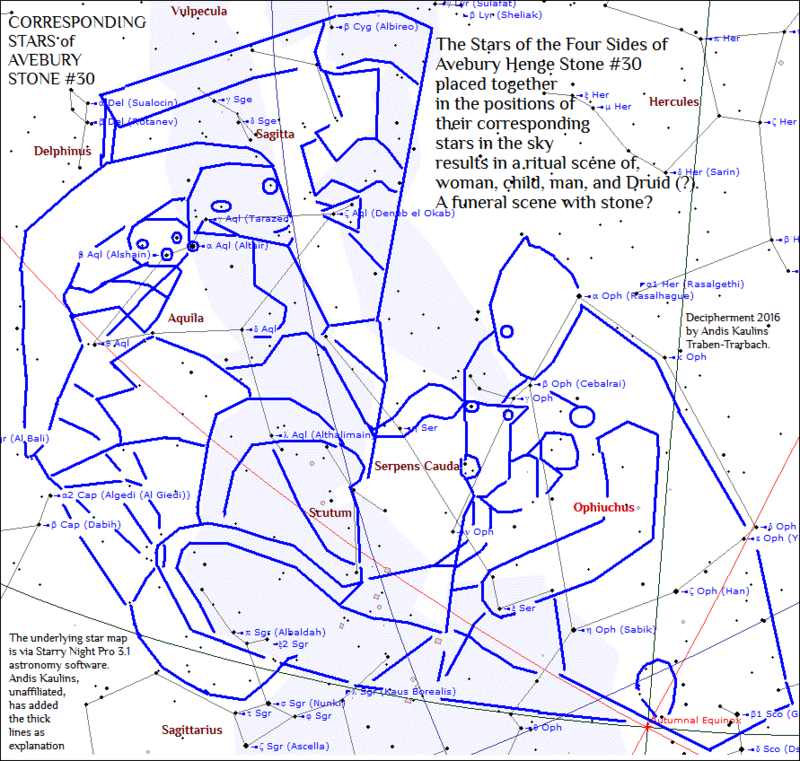 The correspondence of the stars and the shape of the stone is so clear that we did not even find it necessary to trace Stone #30 to get the above result. 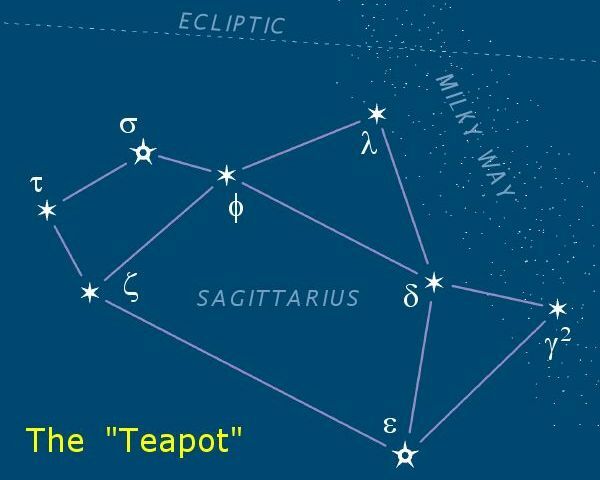 It was -- only initially -- somewhat of a surprise to us that not just the "hole" in the Milky Way was being marked -- because it does have a very similar shape -- but our previous decipherments show that the ancients in carving these stones represented much larger areas of stars -- stellar regions whose representation in stone continued to the left, right and above the henge-outward facing side, as we show in the subsequent postings for Avebury Stone #30. P.S. 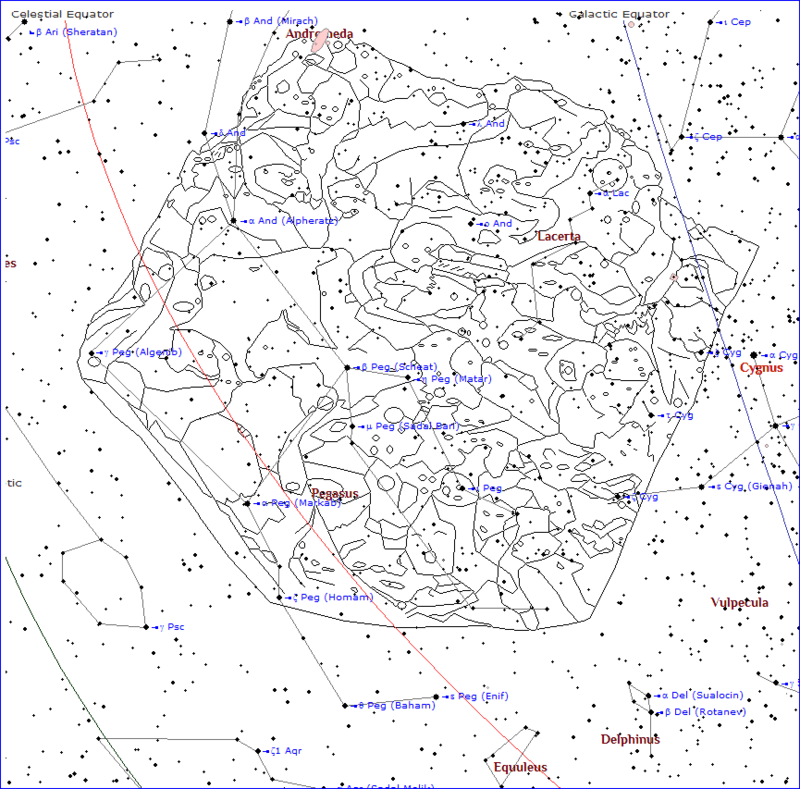 The through-going "lines" in decipherment above from the left bottom corner upward represent the Ecliptic, the Celestial Equator and the Galactic Equator. Avebury Stone #42 on its Left Side viewed henge-outward marks stars directly to the left of the stars in Sagittarius marked on the henge-outward frontal face of the stone. 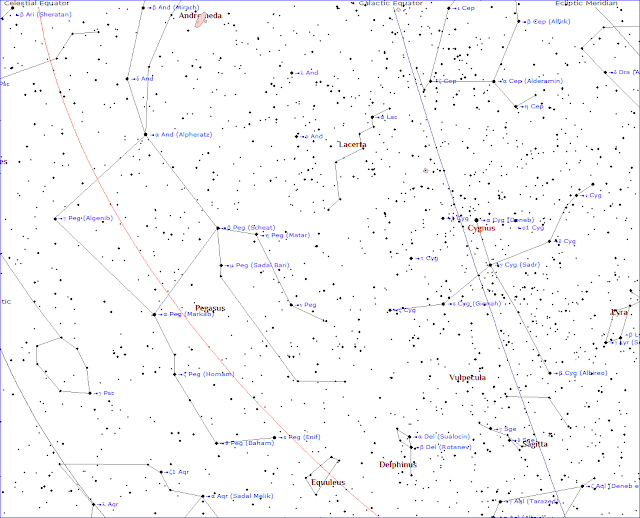 The Left Side represents stars in Ophiuchus, Scorpio and Ara. 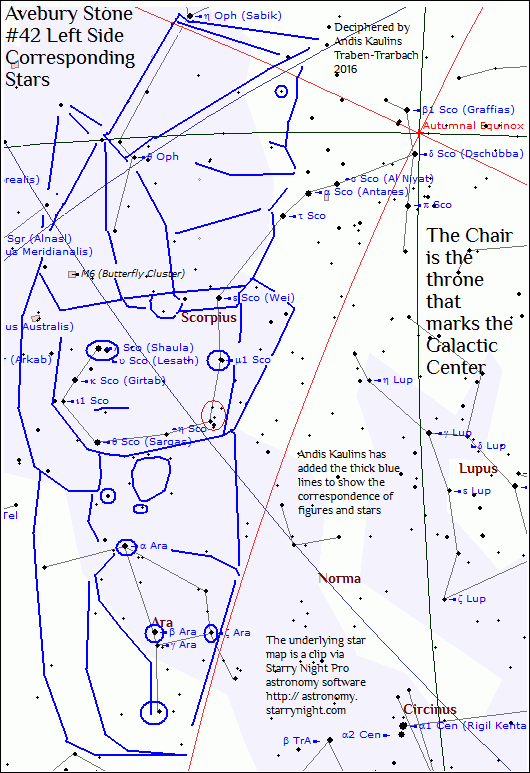 The galactic center is part of the chair being held by the figure, which we interpret to mean that it symbolizes the "throne" of the center of the Milky Way Galaxy whose galactic center is located there. 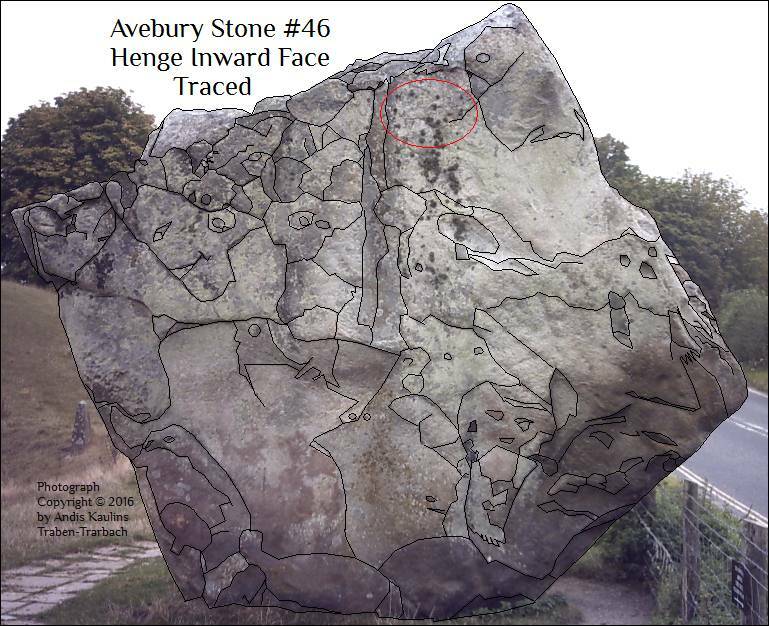 The head at the bottom would seem to signify the underworld of the deceased, who, as we know from Avebury Stone #10 and from our previous decipherment of the Stonehenge sarsens and stones, marked the destination (presumably presumed "origin") to which the souls of the deceased returned. 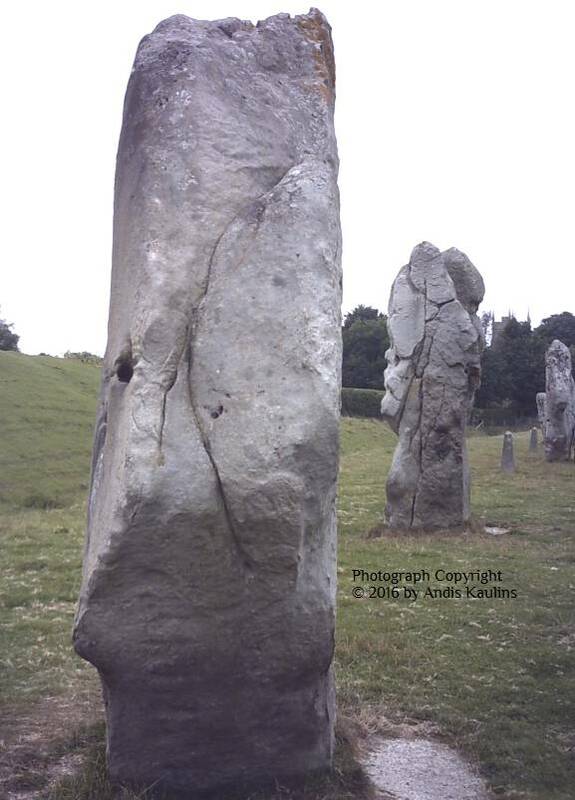 The "Right Side" of Avebury Henge Stone #42 marks stars in Capricorn to the right of the stars of Sagittarius marked on the frontal henge-outward face of the stone. 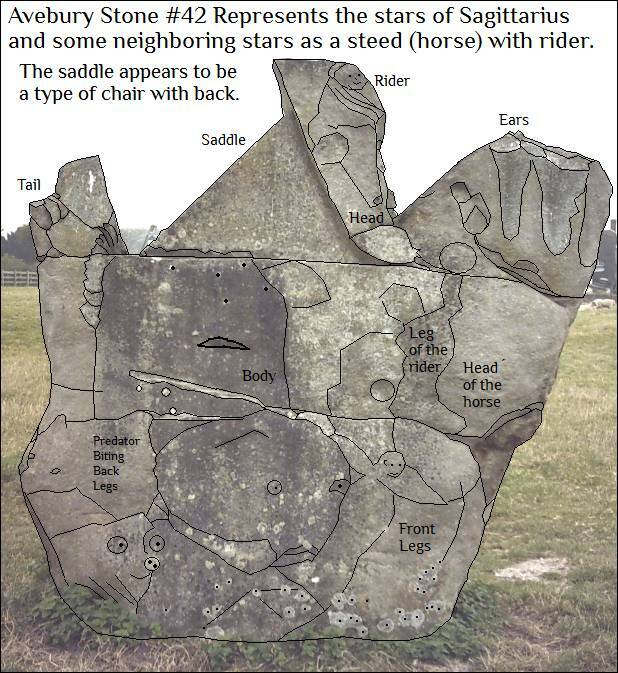 Indeed, as shown in the decipherment below, it includes the back end and the extension of the horse depicted on the henge-outward front face. 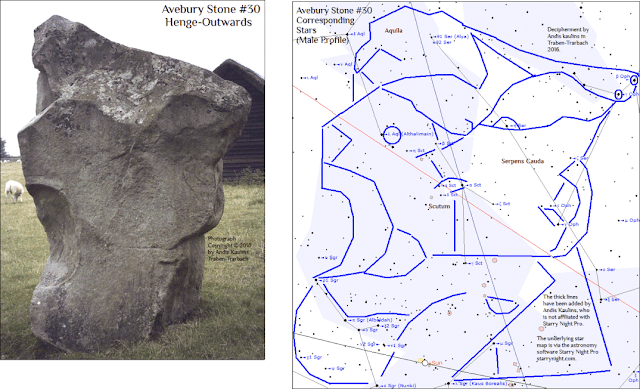 The creators of Avebury are pretty consistent in the way that the megaliths at Avebury Henge were carved to represent stars. 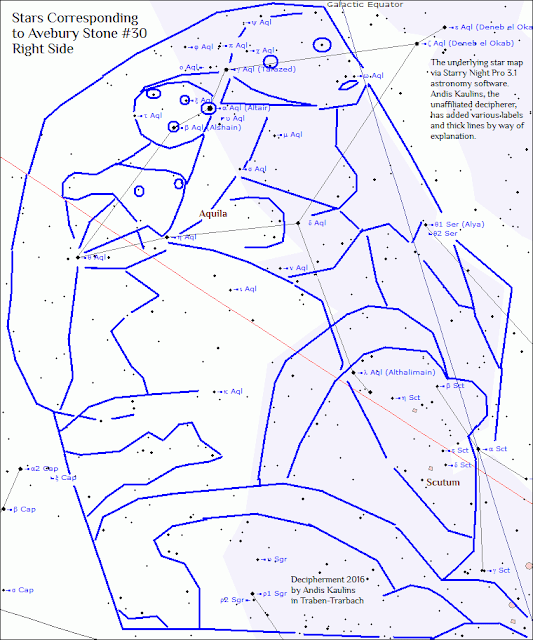 The henge-outward face marks "outer" stars toward the Milky Way, Ecliptic and Celestial Equator. The henge-inward face marks stars toward the center of the starry heavens (i.e. 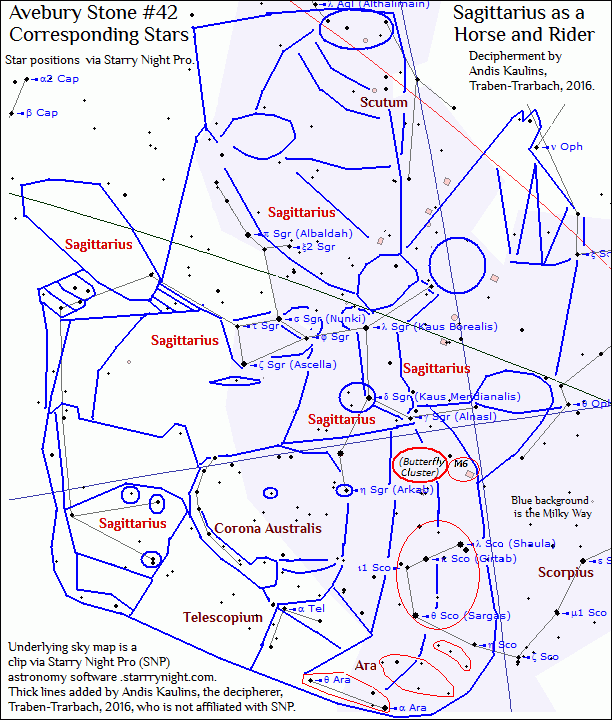 North Ecliptic and North Celestial Poles). 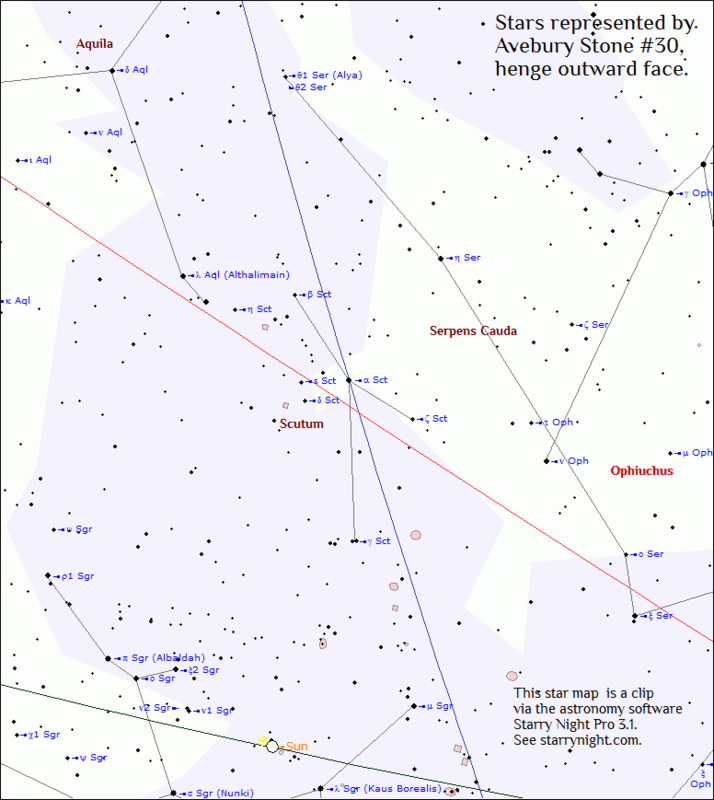 Those henge-inward stars are immediately "above" the henge-outward stars in the sky. 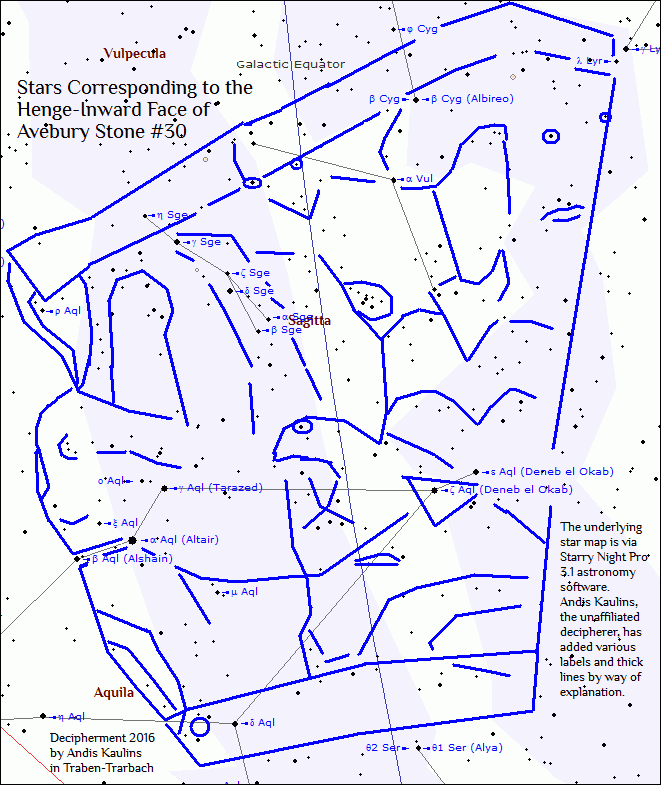 The narrower "sides" of each stone mark stars to the respective sides of the stars previously identified on the henge-outward and henge-inward faces. 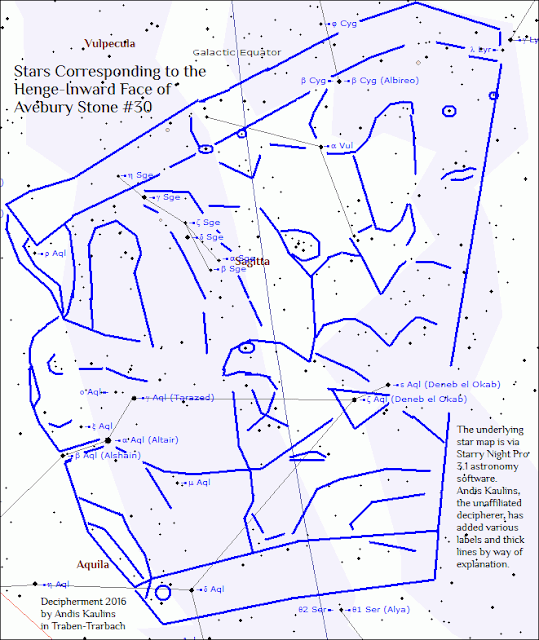 This is also true for Avebury Stone #42, where the henge-outward face marks the stars of Sagittarius. Accordingly, when we "decipher" the remaining sides of that megalith, we already "know" where in the heavens the appropriate stars are, though re-drawing the figures on stone is not always intuitively obvious, and it takes some work to figure out what the ancients were doing. The henge-inward face of Avebury Stone #42 thus represents the stars of Aquila, the Eagle. The three images below show a photo clip of our original photograph of Avebury Stone #42, plus a tracing of the most prominent lines and markings on the stone via our zoom-enabled graphic software, and then the corresponding stars to the figures, lines and markings carved in stone, including the entire shape of the megalith itself. We forgot to circle the face in the lower left hand corner on the sky map. Do you see it? 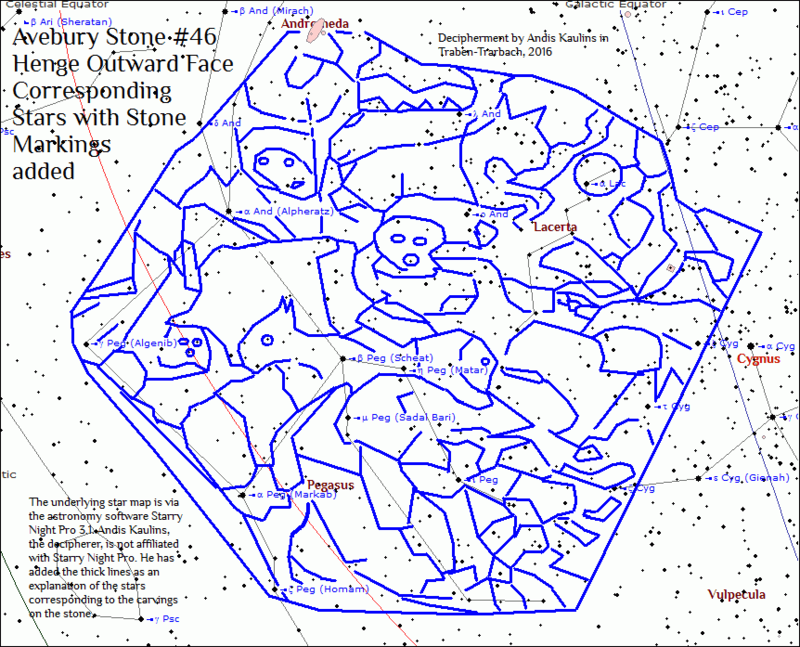 Compare the stone and the sky map above. 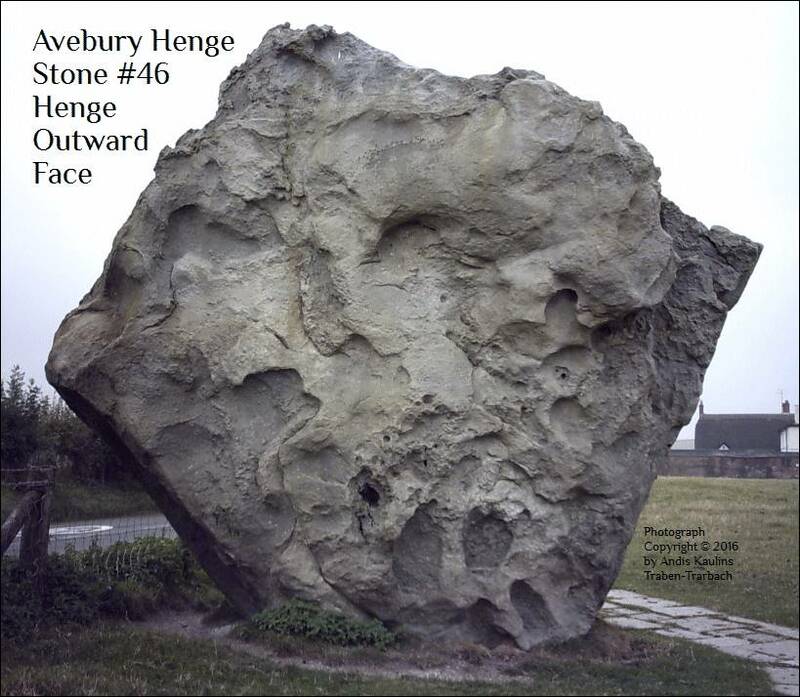 Avebury Stone #42 has such a "strange shape" for a megalith. 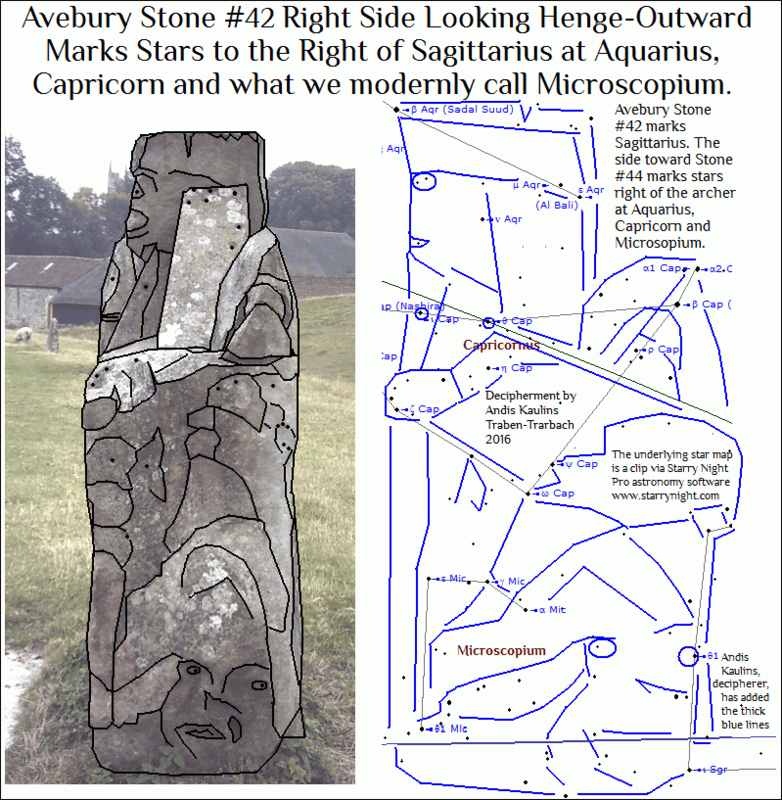 How could prior researchers have missed examining the possible connection of the strange but to us "familiar" shape of Avebury Stone #42 to the stars of Sagittarius, the equestrian archer of old and the astronomical Chiron? 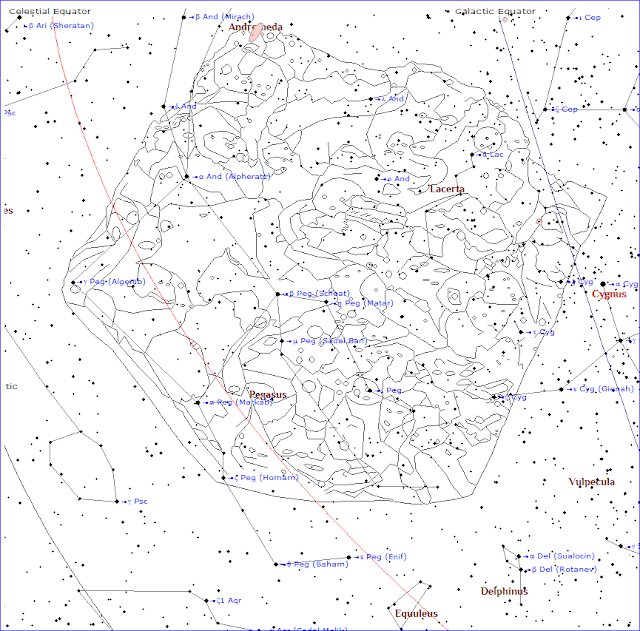 The fabled early shape of Sagittarius in the stars, according to Richard Hinckley Allen's Star Names was as half-man and half-steed, either originally or later as an archer on horseback, and found later in the Centaur Chiron. 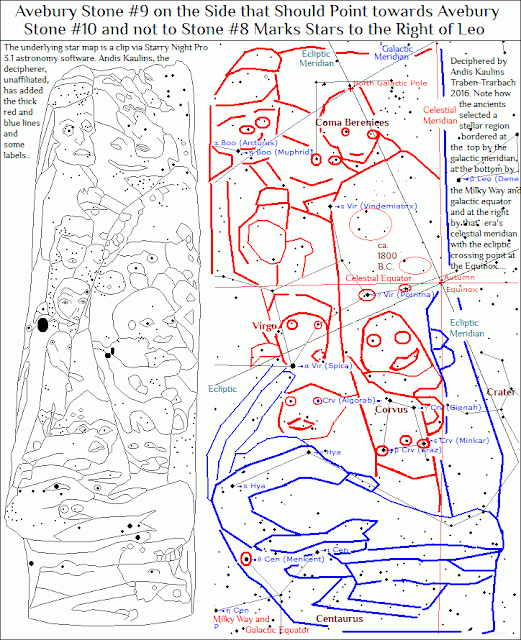 the "left side" of Avebury Stone #42 (seen henge-outward) marks stars next to Sagittarius in the direction of Scorpio, including the portrayal of the center of the Milky Way Galaxy as a chair-type "throne" at the galactic center, whose design reminds of the throne of Minoan Knossos and generally recalls our work on the Phaistos Disk. The other three sides of Avebury Stone #42 are deciphered in the immediately subsequent postings. 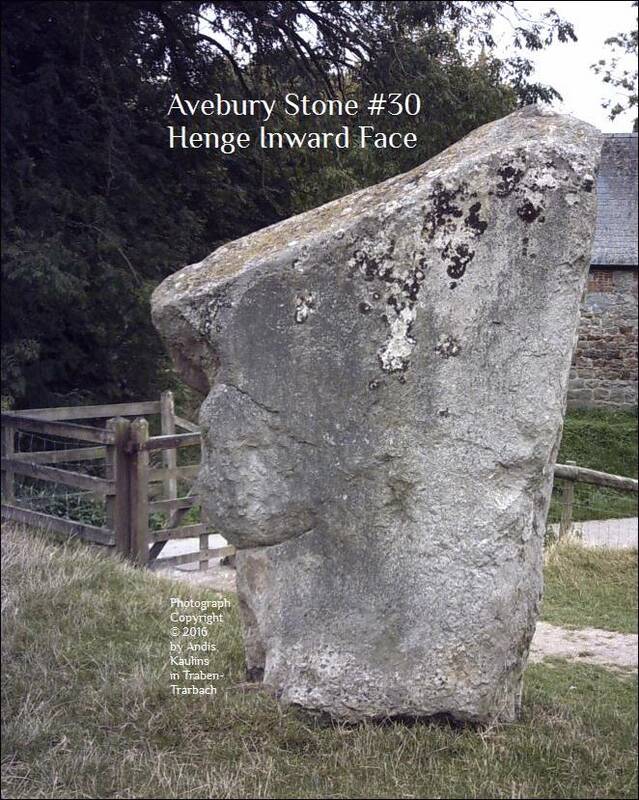 Some of the diverse talents of ancient man become visible when we examine collectively all four sides of Avebury Stone #9 in the heaven of stars at once. What is the result? 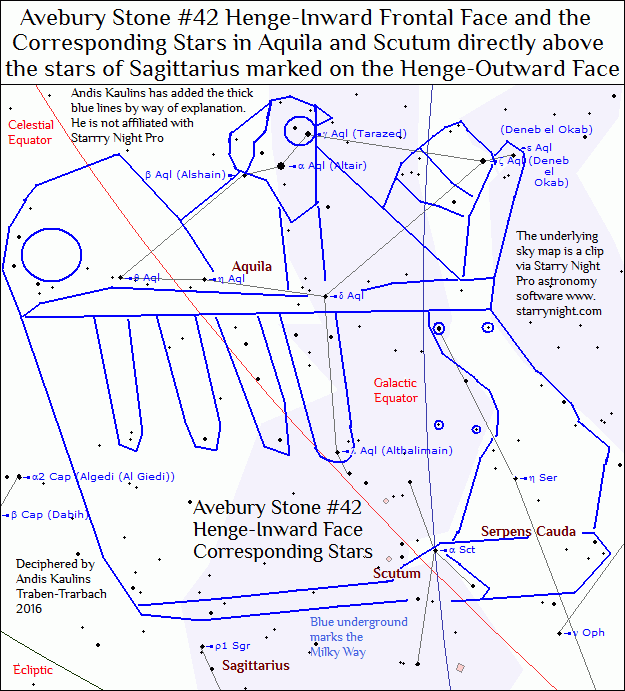 Note how the two broader faces and two narrower sides of the stone mark stars that are immediately adjacent to each other. 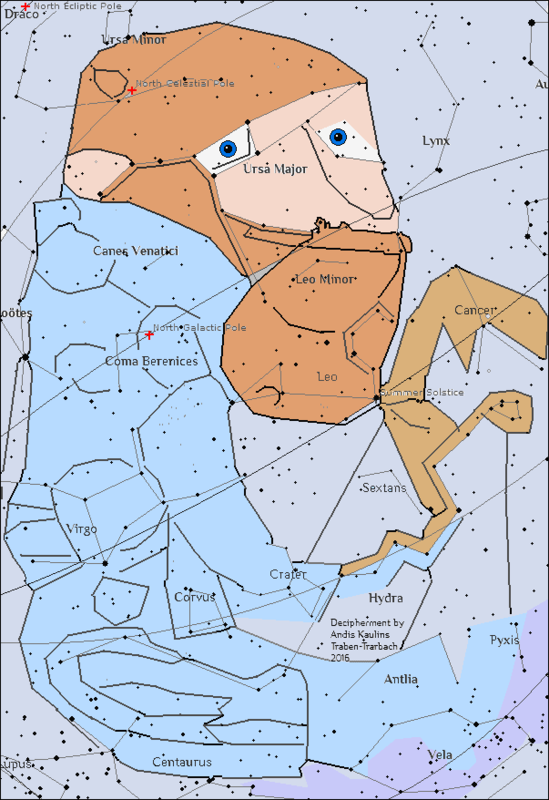 We were astonished to find that placing all four surface shapes together at the location of our decipherment of their applicable stars resulted in the image of a bearded man wielding an antler tool. This we did not expect. 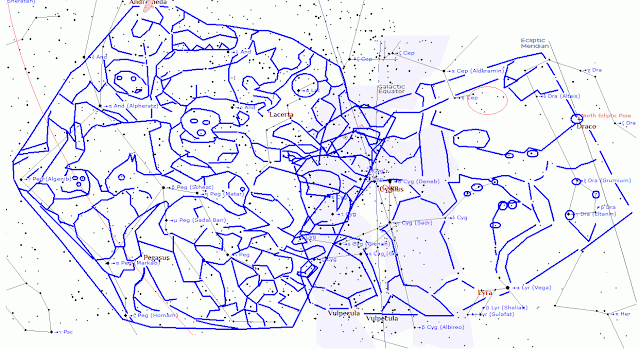 We were initially only trying to get a more comprehensive sky map representation. 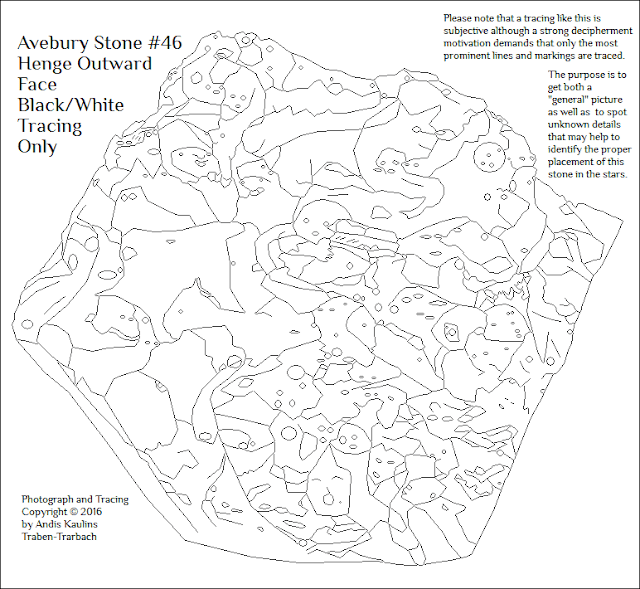 The side of Avebury Henge Stone #9 which currently faces Avebury Stone #8 must correctly face Avebury Stone #10 while the side of Avebury Henge Stone #9 currently facing Stone#10 must correctly face Stone #8. 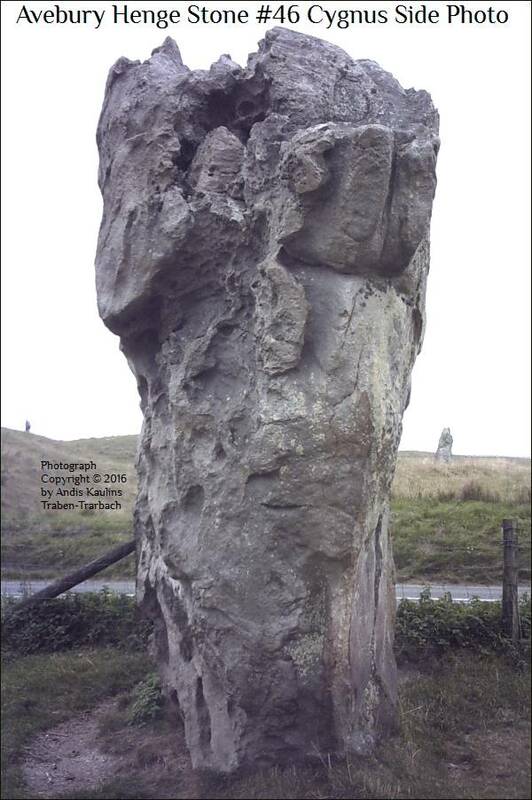 Their false positions are the result of Avebury Stone #9 having been falsely re-erected in the year 1938. See our previous postings for coverage of that story. 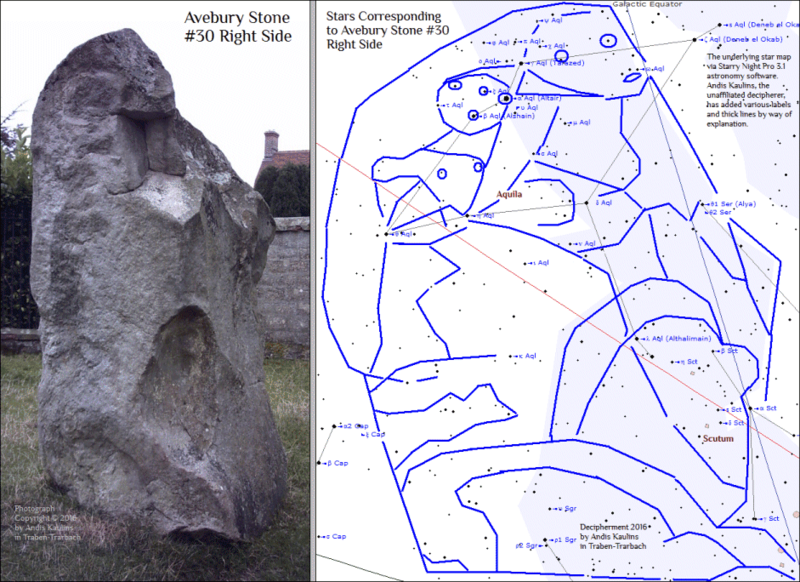 Here we present our photographs of the two sides of Avebury Stone #9 and their proper astronomical decipherment as marking stars as deciphered. 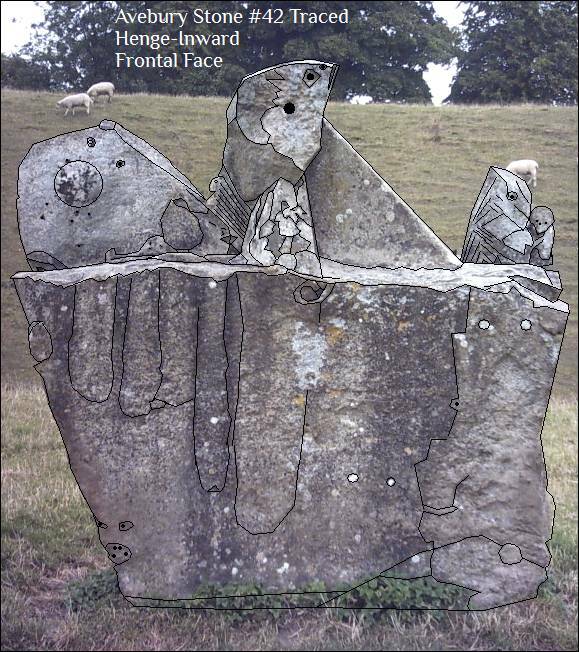 These sides were more difficult to interpret than the large frontal faces of Avebury Stone #9, perhaps simply because they offer less space for carving of images. 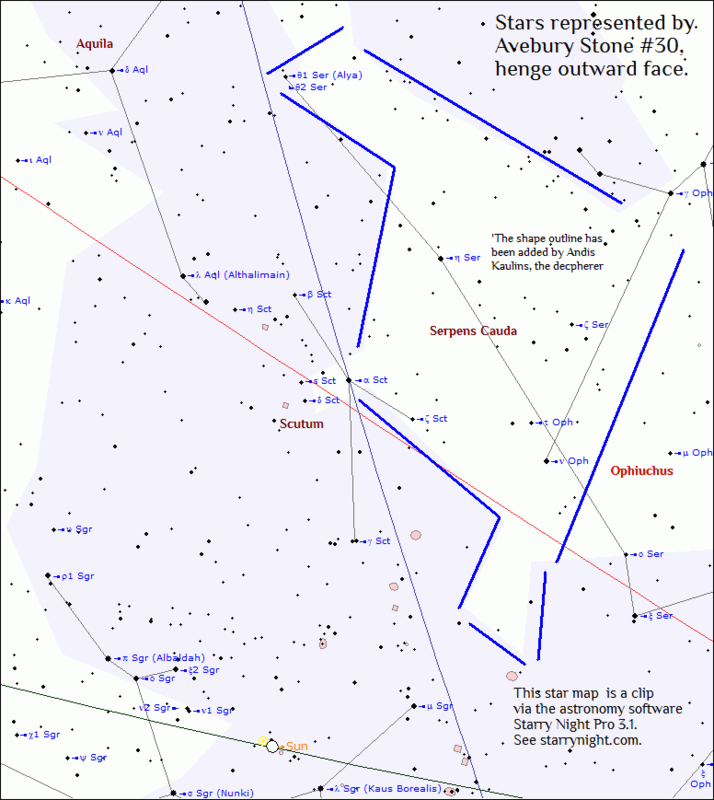 There is a bird at the throat of Hydra in the image above, which is a very old motif to which we attribute the "thunderbird" mythology in North America and which we found at the Roche Percée petroglyphs of Saskatchewan, SK, Canada, where it marks stars below Hydra and to the left of Canis Major and above Puppis (p. 148 of Volume 1 of the books cited below). Here the bird is placed further left. There will be more connections between the Old World and New World in coming Avebury decipherments. 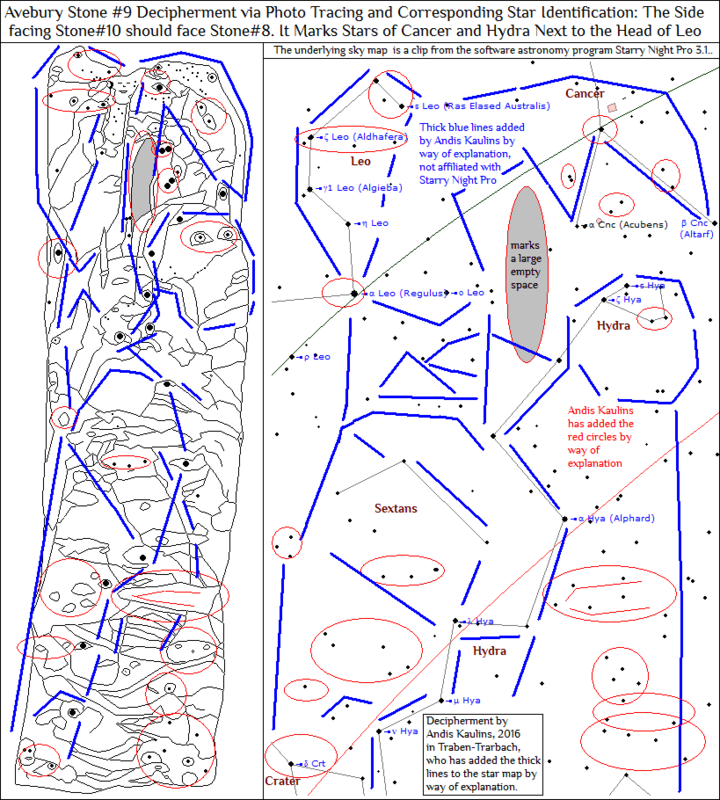 Sky Earth Native America 1 : American Indian Rock Art Petroglyphs Pictographs Cave Paintings Earthworks & Mounds as Land Survey & Astronomy, Volume 1, Edition 2, 266 pages, by Andis Kaulins. 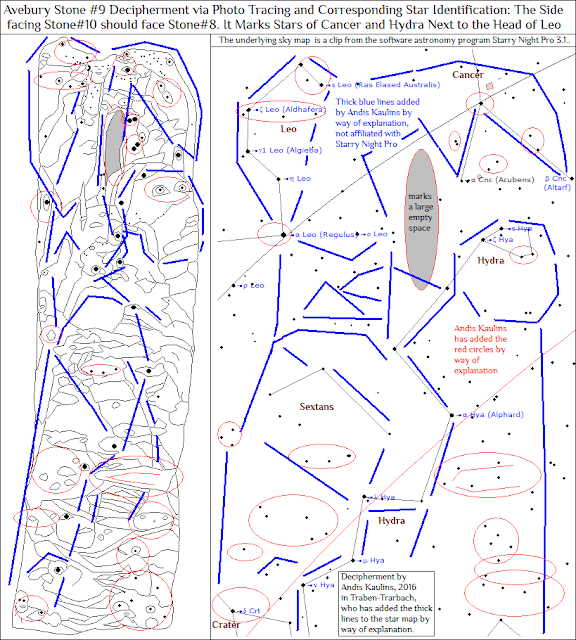 Sky Earth Native America 2 : American Indian Rock Art Petroglyphs Pictographs Cave Paintings Earthworks & Mounds as Land Survey & Astronomy, Volume 2, Edition 2, 262 pages, by Andis Kaulins.